This is still the one we want for our own personal arsenals. Yes, the banana clip is a form-over-function affair with a limited capacity, but forget about that. Just slap on a 25-round drum and go to town (please note that we incorrectly stated before that Kohl’s will be getting an exclusive with this combination–we have since found out from Hasbro PR that this is incorrect. It is the Slingfire that will get a 25-round drum as a Kohl’s exclusive). 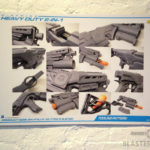 As with our hands-on at Toy Fair earlier this year, the Demolisher did not dissapoint. Without being able to measure, beyond-Elite distances seem entirely possible, and the Nerf execs confirmed this is more than a Stryfe re-shell in terms of performance (and it felt like it). Darts flew fast and hit hard, and they seemed very, very accurate. The rate of fire was fast, and we never ran into a jam (nor did we see anyone else have a jam). This is still a great looking blaster, though we found out that the orange colors versus blue/white was simply based on aesthetics (versus separate line distinctions or anything else). We have a Demolisher on the way for a full test and review. Perhaps even more than the Demolisher, the Slingfire is highly coveted, but it seems every time this blaster is mentioned, someone has a hissy-fit about the handle not being able to stand-up to repeated use (or abuse). All this fear and consternation is coming from people who have never even held this blaster, much less used it. Well, we’ve used it several times now, and we’re here to tell you–stop worrying about the damn handle! It’s not brittle and it’s not weak-feeling. We’ve said it before and we’ll say it again–it’s durable and isn’t going to break unless you do something crazy (i.e., take a saw to it). You can flip and spin this bad-boy all day long, and it just asks for more. In fact, this is exactly what we did, what the reps did, and what every other media person on-hand did (Vas the Stampede even gave a shot at dual-wielding… it wasn’t pretty, but he tried!). The Slingfire was easily the Demolisher’s equal in terms of sheer entertainment value for the night. And just as with the Demolisher, we likewise have one of these on the way for testing and review. And yes, we’ll flip the crap out of it and try to break the handle. UPDATE: Since the NYC event, we have learned from Hasbro PR that the Slingfire will be getting a 25-round drum as a Kohl’s exclusive. We have no idea how one will flip and spin a Slingfire with a drum like that attached! The bow that seemingly no one asked for still looks a bit goofy, but it’s actually quite fun to use… and it turns out, kids actually did ask for it. We were informed by Nerf execs that boys wanted something like the Heartbreaker bow for girls, so this is what was developed. Apparently they tried out several different designs (with compound bows and the like), but ultimately wanted something different than any of their competition who had also done bows. So with Mega in the works, this was apparently a good fit. In any event, we gave it a go (just as we did at Toy Fair), and the pull-back action is still fun and tactile, while the whistling Mega darts are a scream (literally). Supposedly the Thunderbow can hit 100 feet. We’re not entirely sure about this based on our time with it, but admittedly we have not had an opportunity to test it in an environment where it can be used to its potential. And just as an aside, we learned that “Mega”-branded darts will likely come packed-in (much like other specially-printed darts, like the camo ones before and the Zombie Strike ones we’ve seen recently). This one may surprise a few of the naysayers. Speaking of things no one asked for, we’re still not sure what to make of the Cam ECS-12. First, we found out that the Nerf Cam ECS-12 will be available online only (Amazon, Wal-Mart, etc. ), which will also be the case with the Attacknid (with one exception–the Attacknid will be available in-store at Toys “R” Us, as well). 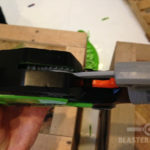 We spent a lot of time talking to the Nerf execs about how this blaster came to be, as well as it’s place in the market. It’s clear that there was a balancing act between features and cost, and it was noted that the SD card is included–an expense that Nerf felt was necessary for families to be able to use the product right away without having to make an additional investment. We’ll say that we can see the novelty in the idea behind the Nerf Cam… pull-off an amazing shot, capture the event, send it to a friend, repeat. The camera quality is low, but in reality, it doesn’t really matter, since you’re not recording feature films–all you need is a record of the unbelievable shot you just nailed (and/or record of the person you just tagged who claims you missed), and now you’ve got it. So far, so good. But here’s the problem as we see it… actually, multiple problems: 1) the price is still just too high, 2) the blaster is too big, 3) there is no modularity (see point 2), and 4) the Stryfe exists. On that last point, we do expect the Cam ECS-12 to have “XD” ranges close to 90 feet, which would allow it to outperform a standard Stryfe, but then you have the Demolisher or Slingfire for 1/3 the price, and with other unique elements. 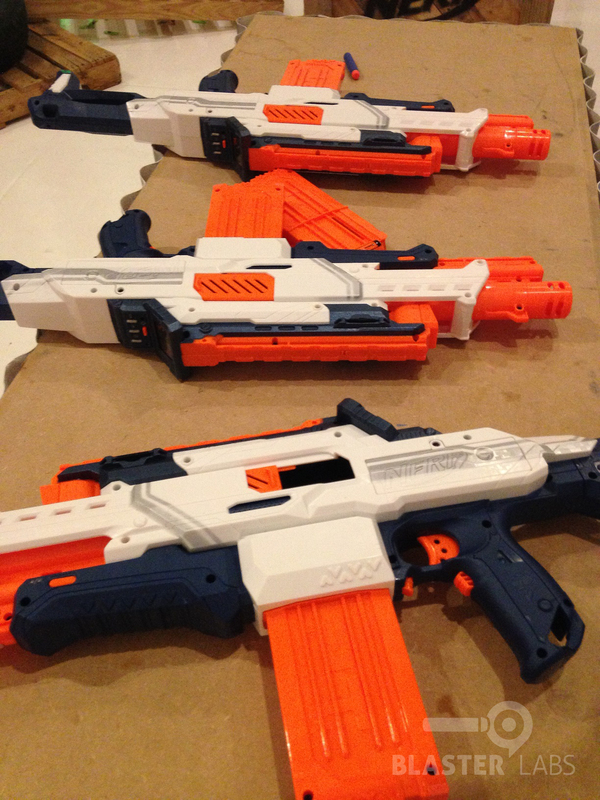 Nonetheless, we see what Nerf was trying to do with this one. We’re just not sure how the market will react. When asked if we might see a version without an SD card at a lower price, we were told this was a possibility in the future, but it depends on the initial reception (i.e., sales). 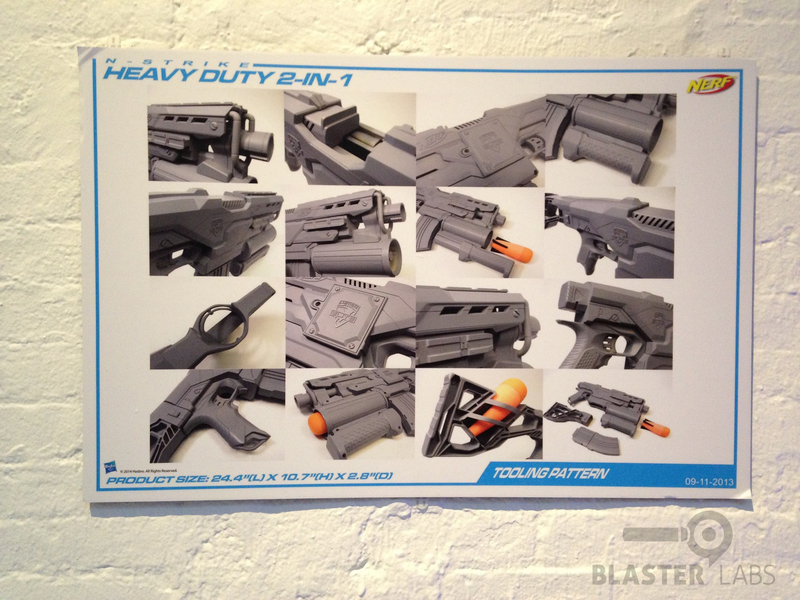 While we did spend some additional hands-on time with blasters that are due to hit shelves any day now (Amazon, in particular, is listing each of the above as being ready to ship with July 1st delivery estimates), we actually spent the bulk of the evening speaking with Nerf execs about some of the questions we get asked most often. 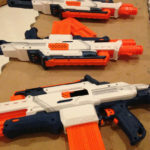 There’s still a lot that they understandably weren’t ready to share, but we nonetheless came away with a better understanding of where the Nerf team stands on certain topics. 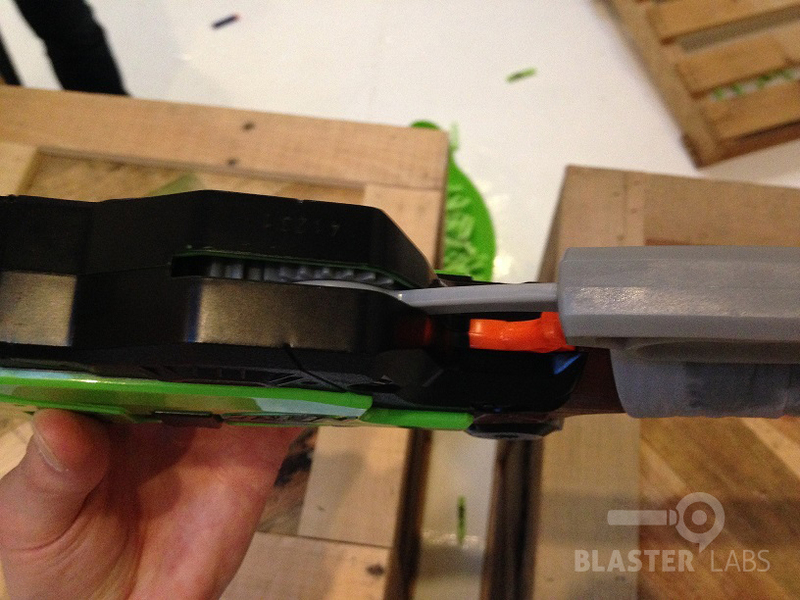 As first revealed during our Google Hangouts session with Nerf, this mystery blaster will be something special, and we got official confirmation that it will be more than just a repaint or reshell. We still don’t have specifics on what to expect, but have been again told it won’t disappoint. There was also a passing hint that something special may be in the works for the Rebelle line, as well. One thing we hear all the time from the NIC is the desire for standalone accessories that can be added to blasters. And frankly, we’re shocked Hasbro hasn’t jumped on this. In many industries, add-ons are where the money is made (think Porsche, for example). All one has to do is look at the stampede created when a Pinpoint Site shows-up on eBay. Of course, during our Google Hangouts session, this topic did come up (we asked specifically, actually), and we were given vague answers about Target exclusives and that we “won’t be disappointed in 2015.” Unfortunately, this was roughly the same message we received this time around, as well, though in conversations with two executives, they expanded on the finer points of the retail relations involved, and the business cases required to make accessory sales work. Nevertheless, they were receptive to the cries from the NIC, and again hinted that they are in the process of developing something further around this, perhaps for 2015. While this isn’t the sort of thing Hasbro would necessarily want to advertise, we’re more certain than ever that the Vortex name as a stand-alone sub-brand is history. Our first hints were at Toy Fair, when reps would neither confirm nor deny that the line was being put out to pasture. Instead, we were directed to the Zombie Strike line as proof of life. 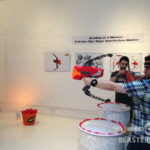 Then, during our recent Google Hangouts session, we noticed that on the wall behind the Nerf designers and marketers at Hasbro HQ, they clearly had Elite, Mega, Zombie Strike, Rebelle and Super Soaker brand marquees on display, but not Vortex. When we tried to pin-down two Nerf execs for an answer this time, we were given a more nuanced explanation that Vortex had been oversaturated in the market, and it basically needs time to cool down (i.e., clear shelf space of models that didn’t move as quickly as planned). Therefore, retail reception to more in the Vortex line is not likely to be strong, which would tend to make a better case for integrating Vortex into other lines (like Zombie Strike). So, while we still don’t have anything official, we would urge everyone who enjoys the Vortex line to stock up while you can. We don’t believe these products are gone, and we did get hints that they could show up again, but they certainly are not as much of a focus as before. Tonight we found out that there are not likely to be any additional Mega-branded products with external magazines. After the Centurion issues, special attention has been given to Mega dart integrity, given their lack of rigidity versus Elite darts (they’re more “squishy”). Instead, we may see more products with either front-loading or internal magazines. Other ideas are apparently also being considered, and they would not deny that flywheels had been looked at, but those are a challenge given the Mega darts’ lack of stiffness. We still play lazer tag, and we know lots of you do, too. Unfortunately, when questioned, it did not appear as though Lazer Tag was going to make a comeback anytime soon. 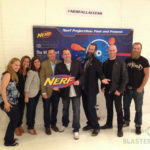 Although Nerf has a good relationship with the original developer of Lazer Tag, and the brand has apparently been moved back to the same group that develops Nerf blasters (versus games), there isn’t currently a push to bring a new system to market. The Nerf team acknowledged that the current LTAR system isn’t even compatible with current versions of the iPhone, and they didn’t say a new system was out-of-the-question, but it doesn’t appear to be a priority. Well, that about does it for now. It’s been a long day of travel and everything that goes with it, but it was certainly worthwhile. Although we didn’t get to spend much time with them, we enjoyed seeing our counterparts from Click Click Bamf, Foam From Above, and Adult Fans of Nerf, among others. We got a lot of face-time with Nerf execs, and would especially like to thank the VP of Global Brand Strategy and Marketing for Nerf and Rebelle, with whom we spent more than our fair share of time. And Mr. Jablonski–we’re going to get more time with you on the next go-round… Count on it! It was a great night with great people and some awesome products. 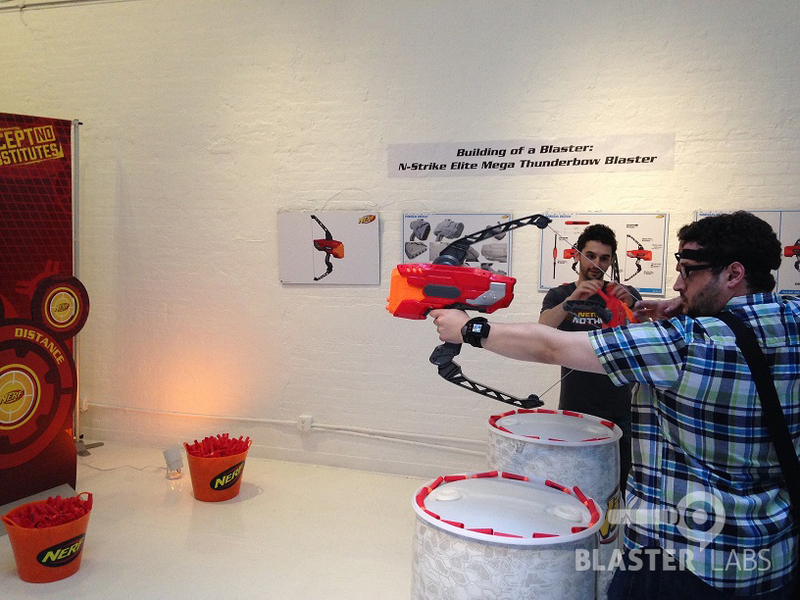 The displays showing a sampling of 45 years of Nerf products was a fun reminder, and the “behind-the-scenes” illustrations of the blaster development process was an especially interesting treat. Getting to spend more time with all the new products was, of course, the icing on the cake. 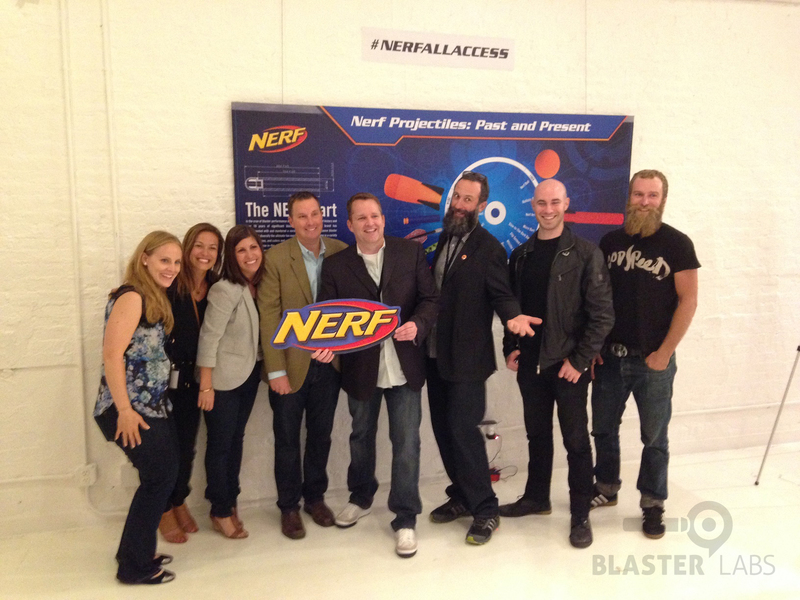 We want to again thank Hasbro and their PR firm for showing us a good time in the big city. We have several fun, new products to look forward to this fall (or sooner), and are already looking forward to what you have in store for us in 2015 and beyond! What really confuses me is Nerf had some GREAT ideas for accessories… but instead of releasing them as such, they’re forcing people into buying new, redundant blasters. I’m glad to hear that the Demolisher is a good blaster.. but really.. make the grenade launcher as a tac-rail accessory and sell it with the matching stock marketed as a stryfe upgrade kit (that one could also use with the retailator+barrel. The banana clips work on any clip gun so just sell them as a generic addon. Edit: It just makes no sense to have the stock with grenade storage be detachable when the launcher isn’t. I’m not going to use that stock on anything else, and not going to bother with a different stock on that blaster, soooooo…. And the ECS-12 brings nothing new blaster-wise, why not make the cam an separate tac-rail item that I can put on any of the blasters I already have? I’m not going to pay $80 for an extra blaster with a crappy cam. But I’d probably pay $20-$30 for a cam tac-rail accessory that I could put on any of my blasters. Why even have tac-rails if you don’t have the ability to customize your blasters.